Wow is it already 10 years?! Seems like yesterday that Pinkbike.com was simply a message board for local riders to post where to meet for the next ride and to share their riding stories from the last great adventure. We are celebrating our 10 year anniversary by giving away amazing prizes in the next 50 weeks! Race Face Components Inc., one of North America’s leading producers of high-end mountain bike components, apparel and protection, is proud to announce the signing of pro shredder Mike Kinrade to the team. Using Race Face’s Atlas FR cranks, high performance clothing and a brand new line of protection, the Kinradical one will be crushing it well into 2010. Time to GET FIT for spring and beyond! If you haven’t put in the effort to get fit this off season, now is the time. Mountain biking is an extremely technical sport so even if you are the fittest person in the world, it doesn’t mean you’ll be winning world cups. But, it will play a huge role in helping you ride longer, faster, stronger and most importantly, recover quicker. 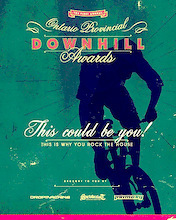 As the 2008 season came to an end, I thought to myself how cool it would be to be a downhill mountain bike team manager. Then I thought, I can be, not for real, but to have a 'dream team' of mountain bikers. So, for the '2009 UCI Downhill World Cup', I bring to you. The 2009 UCI Downhill World Cup...Fantasy League! There are a lot of shiny new things out there that look good on this screen, but after a season on them they may well of let you down. In fact, some you wouldn't piss on, if they were on fire. Here's our new bike. We call it the Driver 8. It has 8 inches of next-generation VPP rear wheel travel. It also has enough room to raise or lower the seat through a 7-inch range. It's got a 1.5" head tube, an 83mm wide bb with ISCG05 mounts and 150mm rear spacing with a Maxle thru-axle. So, just what kind of bike is it supposed to be? Rocky Mountain Bicycles Donates Custom Painted Frame for Brent Thomson Medical Fund. Rocky Mountain Bicycles (RMB) is pleased to announce the donation of a custom painted mountain bike frame for auction, all proceeds will go to benefit the Brent Thomson medical fund. The Auction will begin Thursday January 29th at 5 pm PST. Brent Thomson, Godfather and Trail Master of Bootleg Canyon (bootlegcanyon.org) suffered a heart attack last Saturday while riding the trails that he has famously cut into the mountains surrounding Boulder City, a stones throw from Las Vegas, Nevada. Sometime between 6:40pm, and 8:50 am, January 28th/29th the Rider's Cycles Van was stolen from 1092 Cloverdale Ave, in Victoria BC. Giant is pleased to announce the return of international cross-country stars Adam Craig and Oli Beckingsale to its Global Mountain Bike Team. Both aim to follow stellar 2008 seasons, which included appearances at the Beijing Olympics, with more breakthrough results in mountain biking’s most important events. Joining Craig and Beckingsale, from the United States and Great Britain respectively, on Giant’s Global team is veteran Australian downhill racer Jared Rando. Racers Guild - Entry Level racing at its Best! DH racing unlike Horse Racing does not have to be, "The sport of Kings". For less than a pint of Magners you can can go "racing" here in the U.K and why not the rest of the World? Your local trails? In 2008 we started building a bike park in Eagle Idaho (Boise area) and we wanted to show the Pinkbike community what we have accomplished so far. 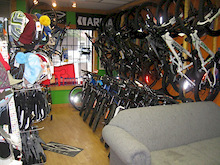 Stop in and check us out on your way to Whistler next year - or wherever your bike may take you. The bike park is the result of 4000 hours of volunteer work and financial support from the city of Eagle, SWIMBA, and many others in the community. Judd deVall and Alpine Bike Parks designed and created phase one of the park which included 3 jump lines and a pump track (designed and installed by Randy Spangler) as well as a dual slalom and mountain cross course (designed and installed by Eric Carter). This year was amazing for me behind the lens in the Aptos. It seems the users here on Pinkbike.com have not minded me uploading my images of these amazing riders ether. I put together a top ten list of my photos. Gravity Logic, a bike park design and innovations company based out of Whistler, BC, reviews their biggest year of buildin', diggin' and riding bike parks around the world and looks forward to what should be an amazing 2009. It’s been almost a year since we at Gravity Logic cast off from the comforts of being owned by Whistler Blackcomb. At first we couldn't be certain if it was the right thing to do, but as we look back on the year we just had building and designing bike parks around the world, we’re pretty sure it was absolutely the right choice. We are made up of four full time individuals who each bring something unique to our business and we are lucky enough to have a significant group of experienced machine operators and trail builders from Whistler and around the world at our fingertips to bring to each of our clients. BC Bike Race announces exciting route changes "From Bridge to Shore"
The BC Bike Race (BCBR) - The Ultimate Singletrack Experience is proud to announce a brand new route for 2009. The BC Bike Race will kick off 2009 with a ride over the Lions Gate Bridge - from downtown Vancouver to the legendary trails of the North Shore. Built in 1938, the landmark Lions Gate Bridge connects the city of Vancouver to the North Shore Mountains and communities. The Lions Gate Bridge is the gateway to BC's singletrack and will provide a spectacular start to the 2009 BC Bike Race. Tear Offs - I see said the blind man to his deaf wife..
Tear-Offs are a wonderful thing, after all they keep you on track and in a straight line and out of the Accident and Emergency Department don’t they? Perhaps we should think of them as essential safety wear, up there with knee pads and a spine protector? First up you need lenses with tear-off posts. These are the small molded dimples that raise some 5mm high at either edge of your goggle lenses, don’t worry as they are not distracting, you can’t even see them from the inside. Top Tip - Whenever you buy a replacement lenses, always buy one with these posts on as you never know when you might need tear-offs, we do ride in the mountains and hills after all! Tonic Fab Launches New Site - About time! 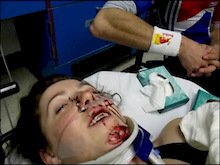 "It took less time for me to shatter a bone in my leg, heal, and enjoy a good riding season than finish our new website. Not only was my injury quicker, it was a lot less painful. We are clearly not Internet scientists." Just Reid Racing will be taking a big step forward in 2009. It's going to be a tough season, both on and off the race track for a lot of teams but we aim to make 2009 a big success! We are stoked to announce that riding along side Ben this season will be UK ripper “Adam Brayton”. Do you live within the GTA? Are you in Middle or High School? Ever wonder who the guy in the Titec or Scott USA ads is that is sending it super large? Chances are you were looking at a shot of Mike Hopkins as he's the quiet guy from Rossland BC that loves to charge and send it in front of the lens. Mike not only kills the freeride scene, but he's one hell of a big mountain skier too! I was just checking out his site and you should too! Got the winter blues? Not enough riding lately? Wondering if the snow will ever melt? You can go ride some dirt right now, it's there, you might just have to work for it. A few of us were feeling the pain of not getting out, so we took matters into our own hands and you can too. HCFR 2k9 Calendar - Last chance to pick it up! 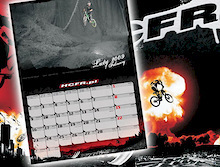 If you still haven't picked up your calendar for 2k9, we've got something just for you. HCFR Association for the second time is proud to present its 2k9 wall calendar. The most amazing photos from the best photographers, shot on unique locations in Poland, printed on high quality 200g paper in 2x24x34cm format. Want to own your own bike shop? Very rare opportunity to purchase a successful, established and profitable high end bicycle and ski store in one of Kootenays fastest growing resort towns. Excellent relationship with all suppliers including Kona, Norco, Fox, TLD, Intense, Oakley, Atomic, Armada, Line, 4frnt, etc. Large local and loyal customer base and have territorial exclusivity on most brands sold. 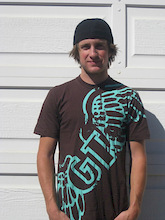 Geax is proud to announce its partnership with Cameron Zink, distinguished slopestyle and gravity athlete who will ride Geax tires and represent the brand in these disciplines for the 2009 season. Cam is the first US gravity pro ever sponsored by Geax. 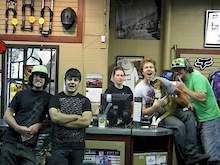 The Yard Bikers, 508 industries and Feeney Films Rocked in 08 and we're ready to Roll for 09 ! 2008 was a Hectic summer in New England. 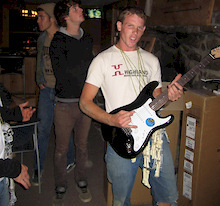 The Yard Bikers spent the summer excavating Highland Mountain and 508 Industries was busy dominating the events there. This made for a great summer of shooting for Feeney Films. SafeTband and how it can help you. As a rider progresses and they advance their skills, there is no doubt that they are pushing the envelope in order to go bigger and faster. In several instances, there are often risks associated with pushing the envelope. Fortunately, there is a North American company called SafeTband looking out for the safety of fellow riders around the world. The SafeTband is a fabric pouch with an identification card on the inside that has a Velcro fastener that can be attached to the strap of a pair of goggles or any loops on a hydration pack or clothing. 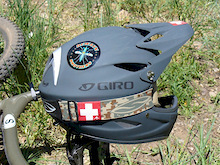 In order to maximize its efficiency and effectiveness, it is recommended that it be kept on the rider rather than attached to somewhere on a bike that can be overlooked in an emergency. Dylan Dean Designs (D3) is proud to announce the addition of mountain bike star athlete Jared Graves to the mountain bike factory team! 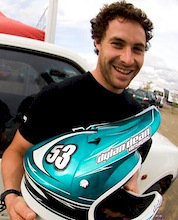 Jared returns to the D3 team after a short absence, and will don D3 custom paintwork throughout the 2009 & 2010 seasons. Wondering what your new rig is going to look like? Visit yeticycles.com to check out the 2009 full product line including never-before-seen shots of the AS-R 7 and 303R-DH. All models include updated specs and photos! 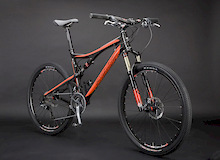 Or scroll down and see the new 303 R DH and AS-R 7 here! Some of you may have heard about these new regulations and thinking what are they, and what/who do they impact? There is stuff popping up all over biking websites about these new regulations, and people asking questions about it. I got a little inside info about it from the BMX coordinator at Norco Bikes. Read on to find out more about these new regulations. Jamaica Fat Tyre Festival - Time Set! The St. Mary Off-Road Bicycling Association (SMORBA) is pleased to announce that the coolest mountain bike event on the planet is back! The 11th Annual Jamaica Fat Tyre Festival is set for February 11-15 in the lush, tropical mountains of St. Mary. This year’s event will feature even more of the “irie vibes” that have recently been featured in various magazines as well as on Ride Guide TV. Rocky Mountain Bicycles (RMB) is proud to announce the new Rocky Mountain Bicycles Factory XC-Epic Racing Team. Rocky Mountain Bicycles has been at the forefront of all facets of mountain bike competition;from early DH and XC victories (circa 1991*) to pioneering Freeride and most recently dominating epic stage racing. Gamut USA has released its new P20 bashguard design. Like its P30 and P40 counterparts, the new P20 continues Gamut's promise of offering light, simple, and durable chainguides. The new P20's optimized design provides a better way of absorbing energy from impacts by flexing and distributing the impact forces away from critical drive-train components. This approach to bashguard design was originally established in 2004 with the release of Gamut's P40, the choice of 2008 World Cup Champion Greg Minnaar. The P20 accommodates 32-34 tooth setups. As part of Gamut's commitment to best in class rider support, the new P20 includes our lifetime product warranty and any support you need from the Gamut crew. The BC Bike Race - The Ultimate Singletrack Experience is proud to announce the return of Kris Sneddon and Barry Wicks of team Kona, the 2008 winners. The BC Bike Race is proud to have Barry and Kris back, these two exceptional athletes will defend their title beginning June 28 and finishing July 4. 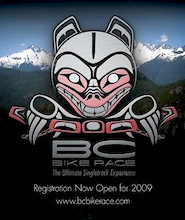 They have confirmed their participation and their goal of victory for the 2009 BC Bike Race. I wish I could tell you that I drove to the coast just for this reason but that’s not the case. I got a phone call from my mom saying my grandpa (her dad) had died. So I packed a bag and we both drove over to help out and attend the funeral. When I was over there and everything was done I thought I would go see my old friend Mike Metzger and check out the Transition Bikes office. While most of the mountain biking world is taking a break from riding because of white blankets of snow, here in SoCal Team Ridgecrest Kids are just getting started for the up coming racing season with sunny 70 degree riding conditions. Recently the old school hardtail company known as Evil has stepped it up, and announced that they are going to be creating a downhill bike to rule them all - the Revolt. 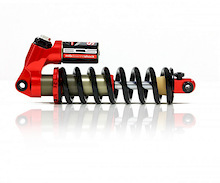 In conjunction with Dave Weagle, Evil bikes has come up with the DELTAsystem, a suspension patent that utilizes 203mm of travel, and sets a benchmark for performance and tunability. The inauguration of a fresh president here in the USA seems like an auspicious time to take the wraps off Santa Cruz Bicycles' most closely guarded secret since, well, ever. Ladies and gentlemen, departing Trek riding Texan Republicans and incoming Illinois hoop shooting Democrats, please lend a hand for the arrival of the totally new and completely awesome, carbon fiber Blur XC! Industry veterans Erik Olson and Dan Powell have launched Portland Design Works (PDW), a new brand of urban bicycle accessories with a focus on simple, beautiful design. The first two categories of product, grips and inflation, will begin shipping in mid-February and can be viewed on the new PDW website, www.ridepdw.com. Cargo racks, tools, mini-pumps and fenders will be available by late spring. Mud, mud, glorious mud, there's nothing more like it for cooling the blood! Today’s lesson is on Mud Tyres so best be paying attention as there might be a question or two later. First off lets dispel all those idiots on the forum that say, “I ride Minions in the mud and they work really well”. Read on to learn what you really need to win races! The 2008 Season is in the books…and we’re back yet again to honour those riders, racers and builders who really deserve it. We saw a little bit of everything during ‘08- from a late start thanks to Mother Nature, the end of an Era with the last Psychosis Race, a few broken collarbones, ankles and such, some new trails being built and old ones being revived in addition to local races and trail days that saw great turn outs and plenty of support. It seemed as though no matter what was going on in this crazy world of ours- people rode the heck out of their bikes! For the 2009 Alberta Freeride Awards, we are changing things up a bit…the entire affair will happen online- from the nominations, to the voting and finally the results! This years National Champs for both DH and XC on July 18/19th is going to be a sell out as it's the same weekend as the St.Ronans Highland Games (Oldest sports event in Scotland)! Come watch the Worlds best DH riders, cheer on the XC, enjoy the processions through the town, tossing the caber, fireworks and loads of men in skirts! Get on the blower now and get your accommodation sorted, it's going to be busier than Bethlehem some 2,000 years ago. What this concept attempts to do is make the streets a tiny bit safer for city bicycle riders. 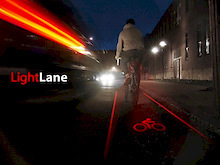 A device attaches to the back of your bicycle and projects an instant bicycle lane onto the road, as this picture shows. That way, you can whip about town without a care in the world, knowing that you’re letting other drivers know that, "hey, this here is a bicycle lane!" Current World Champion Rachel Atherton sustained a dislocated shoulder yesterday when she was involved in a training accident with a car. The Atherton trio have been training hard in Santa Cruz California since the start of January and yesterday was no exception. Details are sketchy but it seems Rachel hit the car head on with her brand new Cervelo road bike taking the brunt of the damage. 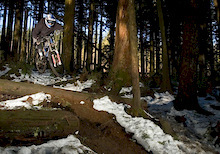 It is with great pleasure that we announce today the creation of a new DH race team in Canada. The XPREZO / Impact Designs / NOVATEC Racing Team originated from the mind of Patrick Bisson (Team Manager) and Jean-Philippe Simard (Team Manager & Team Mechanic). The main reason behind this project was to help some of Quebec best DH athletes to develop themselves in order to achieve their goals and participate/perform at 2010 UCI World Championships that will be held here in Mont-Ste-Anne, where all eyes will be turned towards Canadian & mainly Quebec own athletes. Now that the season is over, I suppose it would be a good time to get some of you stoked on some of the DH trails that exist on Mount Shasta, in NorCal. The trails are legal and user-maintained, on public land. Colonnade Bike Park Mini Trip aka: Escape To Dry Dirt! It has been a bad winter. Instead of the three months of rain we are usually treated to, we have been snowed in, frozen solid, and then flooded out. As it turns out, complaining incessantly does nothing to help the situation! I've been hearing about Seattle's Colonnade Bike Park for awhile now, and it seemed like there was no better time then now to pony up and head South. Nestled safely directly under the massive I-5 highway, the park promised dry dirt and new terrain. In other words, our winter Shangri-La! Inside you'll find way too many pictures and a video showing you what the Colonnade Park is all about! Kona signed Andreu and Lluis Lacondeguy for the following two years. Lluis got an additional Kona clothing sponsorship. The first chance to see the Lacons riding their new bikes will be at the “White Style presented by Kona” winter slopestyle comp in Leogang, Austria, on January 30th. Nowadays there is a very very thin line between real and fake, often it's to close to call. Computers have turned this line into something that is almost impossible to notice to the untrained eye. Recently I saw a photo on Pinkbike that blew my mind, so I am here to share with you guys something very unique, and something I haven't seen before. 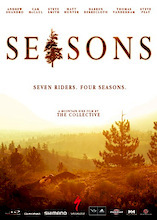 "Seasons" hits the big screen this Saturday night at X-Dance. The Collective rolls into Salt Lake City this weekend for a prime time screening of their latest film as part of X-Dance, the world's most renowned action sports film festival. Launched in 2001 and coinciding each year with the Sundance Film Festival, X-DANCE showcases the year's top action sport films, followed by post-screening Q&A's with filmmakers and athletes. KBC helmets are again pleased to re-sign long time UK freerider Elbry Sandland to its athlete team roster for 2009, Elbry has been a member of the KBC family since 2003 and will again be featured in the KBC helmet's catalog, adverts and posters worldwide and joins AMA road racers, MX racers, Stunt riders and Bobsleighers. Elbry will be using the all new Composite PRO-X helmet featuring ULTRA COMP Shell Constructed using the revolutionary “pre-preg” bag molding process. This makes for a lighter helmet while ensuring consistency in shell thickness, The PRO-X being the first KBC off road helmet to use this technology. Apologies to bring you such bad news. Just heard from a friend that Ben Ineson and Tom Rodgers were killed yesterday in a car crash. These two were the life and soul of every race here in the U.K, this is a very sad day indeed for Mountainbiking. 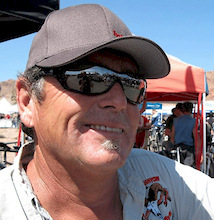 Brent Thomson, Godfather and Trail Master of Bootleg Canyon suffered a heart attack last Saturday while riding the trails that he has famously cut into the mountains surrounding Boulder City, a stones throw from Las Vegas, Nevada. While he is currently resting under doctors care in the hospital, Brent is scheduled for the second Quadruple bi-pass in his life. Sixteen years ago he had the same surgery performed due to an unusually high hereditary cholesterol build-up. X-Fusion Shox Announces the 2009 X-Fusion/Intense Factory Race Program and Roster. Here at X-Fusion we love racing and the lifestyle that goes along with it. After two successful race and media campaigns in North America X-Fusion has decided to take it to another level. We are going International! MTBco achieved a lot in 2008 but 2009 promises to deliver even more. 2009: The mountain biking revolution continues. Read on to find out how we're aiming to make British Columbia's Central Okanagan region a compelling place to add to your list of riding destinations. 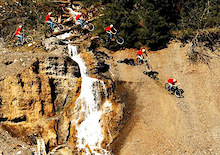 GT Bicycles today announced exciting new additions to the 2009 GT mountain bike team. The team will continue to be gravity-focused, adding Eric Carter, Mick Hannah and Andrew Cho to the GT roster. These three exceptional riders will help support GT’s 30-year race heritage. Following the announcement of Nathan Rennie and Mitch Delfs on-board the KENDA MOREWOOD Team, Gravity Group wish to announce a new partnership with BOS MOUNTAIN BIKE SUSPENSION as official Team Partner for suspension forks and shocks. Nathan Rennie and Mitch Delfs will have the choice between IDYLLE and IDYLLE PRO forks, while the STOY shock will be responsible for rear suspension on their downhill bikes. Aptos is blowing up here on Pinkbike.com with four recent PODs and a VOD in recent weeks. To the locals it's of no surprise with all the talent that lives around here and all the great riding that we have at our finger tips. Heck right now, most of Canada is down in California riding all the goods we get to enjoy every day! Anyone who has paid attention to bike videos and magazines in the past few years (or since the dawn of Freeride) has undoubtedly heard of Kamloops B.C, the mystical city of rolling hills and hot orange sunsets. Home to many fast trails sprinkled with dust and sage bushes, Kamloops is a dream destination for mountain bikers everywhere. Shooting stars Andrew Taylor and Phil Sundbaum from the USA are the newest addition to the adiridas, the international adidas Freeride Crew. To begin their partnership, adidas invited their two newest athletes for a visit in December to do something totally unique: ride their mountain bikes down an Olympic bobsled track! Taylor and Sundbaum will be representing the three stripes as they travel around the world competing and filming for their video project "Summer Of Shred". 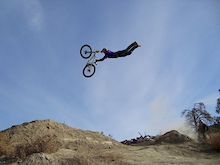 Novato- Calif. Novato-Calif. Marin Bikes is pleased to announce the of addition of Andrew Taylor to the Marin team for 2009. Hailing from Northern California, Taylor has honed his skills to vault him into the top tier of international slopestyle and dirt jump film and competition riders. His close proximity to the US office will provide Marin with a wealth of rider input on product. His charismatic personality on and off the bike will compliment Marin's existing riders Shaums March, Yuri Hauswald and Team Lost Coast Brewery while bringing a new face to Marin’s growing gravity program. Sam Dueck is at bat. Sam Dueck is 16 years old and hails from Chilliwack BC and is one hell of a shredder. This past year Sam buckled down and set goals for himself in relation to how he rides and what he wants to get out of riding in the following years. He's pushing the local riding scene with his determination and skill. He knows you have to work hard to get the results. It Didn't Work - The Teaser. It Didn't Work features some talented riders from Norway during the 2008 season. You might think "what the hell, aren't they way too busy burning down churches and chasing polar bears away from their death-metal rockin' kids", but you would be wrong. 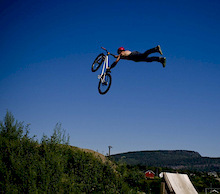 For the last couple of years the riding level in Norway has just exploded. I can still remember a few years back when it was an absolute blast if you got your bike between your legs in a sketchy tailwhip attempt. Nowadays I feel that everybody tailwhips. Everywhere! There are a few things in the biking world that can make or break a rider's day and when you're flying downhill you want to have quality brakes at your finger tips. We have all had run ins with the "not gonna stop me" squeal of wet v-brakes, so it's nice to see a company that has put years of research into a brake that is so dialed. 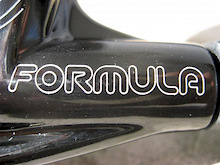 Read on to learn all about the One brake from Formula. 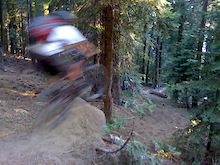 2008 in review with Bush Pilot Biking! Just over two months ago we showed everyone the details behind this year's Urge Kenya event and now it's time to unveil the rider's list of who will be the lucky 10 riders to participate in the event. The past week has been hell in the Lower Mainland. We have been through hip high snow, ice rink streets, and pelting rain. We have experienced it all, and for a small mountain based city that doesn't usually even accumulate snow during the winter season, this is a huge deal for us, and it's starting to pose a pretty big issue. Whhooaa - Commencal Supreme DH WC Ltd Edition!! What makes the Photo Of the Day different from other pictures? As a frequent Pinkbike user I have come to notice certain trends with the POD’s that are usually quite consistent. In this article I will discuss what I believe those trends are, and how when combined they can make for some quite spectacular photographs. Read on and things will start to make some sense! The Doctor is at it again. This time he pounds the pavement and trails in search of old Konas that have stood the test of time. Kona's enigmatic chief bike designer Doug Lafavor loves a bike that lasts forever, and it doesn’t take him long to find 18-year-old Kona bicycles still making their owners happy as clams. The Saab Salomon Megavalanche Entries Open! This is the one! The Holy Grail, The Elephants Graveyard, The Mecca for all you Mountainbikers out there. The Saab Salomon Megavalanche 2009. Entries open on Monday January the 12th at 14:00GMT (London). Get yourself online and entered ASAP as these tickets will run out faster than a loose chicken in a Cambodian village. The 661 MINI DOWNHILL RACE is back in town at the Forest of Dean. Big news if you're a "Mini Ripper" there will be a 10-11 year old class! Get your diary out and mark in Sunday 22nd February 2009. National Mountain-Cross Champion Rich Houseman will be teaching 4-Cross/Mountaincross skills clinics during the 2009 Southridge Winter Race series in Fontana, California. I’m not a bad rider. I can get down most things without parting company with my bike - most of the time. I even I tried some downhill racing again this summer and I’m pleased to say it went ok. I even made the podium at one of the first races but I had no idea this would be the shining pinnacle of my race season. As the summer continued my riding improved and the speed built but somehow I only managed to hold my place in the ranks. There were still a few old boys who were just, well, faster. If only I could find a few seconds per run, I’d be chasing the win and not the podium. What to do? Phone a friend! After talking to a few people it seemed all those who’d tried MMR coaching were raving about it, so I put it at the top of my ”to do” list. Thanks to everyone who came out, we had a fantastic evening, some great prizes were donated by sponsors like a Norco 250 frame and Minoura trainer from Norco Bicycles! Titec Components and Want beverages also gave up some wicked stuff and Industry skate park donated a deity bar and free passes to the park! Read on to see who won! Gravity Group is pleased to announce their partnership with Morewood Bikes as bicycle supplier and co-title sponsor along with Kenda Tires for their World Cup Team. TEAM KENDA MOREWOOD will be represented by two of the most famous names in downhill racing: Nathan Rennie (AUS) and Mitchell Delfs (AUS). 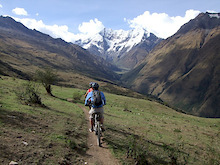 This is a brief story of the Megavalanches in Peru and also an invitation to join us for the next Megavalanche in 2009! The Megavalanche Race started in Peru in 2005. At that time the local riders from Cusco were just a few XC riders. Now it's amazing to see how this race has motivated the local people from Cusco to leave their XC bikes and try to build their DH bikes. Now everybody in Cusco loves to go fast, jump and of course they are strong enough to learn by crashing constantly. What is long, squishy, and white and red? No, not that candy cane that you just found under the couch cushion...although I'm sure that is still ok to eat. 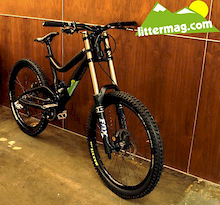 What I'm talking about is Rocky Mountain's new top flight Flatline Pro DH bike. Don't get too excited as the review is still a ways off, but due to sheer boredom (the large amount of snow will do that to me) I've put together a little "preview to a review" article to get your blood flowing during these cold winter nights. Inside we have got Wade Simmons on video from 'Vegas to give us the low down on the Flatline, as well as far too many pictures! 2008 was a very stressful year for me and I’ve decided to make some changes that hopefully will allow me more time to focus on the things that are really important in life: friends, bikes, and whatever exists besides those two things. Fionn tries out her new Evil Undead for the upcoming season and meets up with Missy "The Missile" Giove for a day of fun in the woods. This is a story of an EPIC ride in Peru. It's Epic because it's located on a remote area of the Peruvian Andes, because we have descended more than 4,000m (13,123ft) and we have reached Machu Picchu. 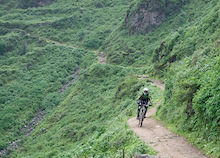 Peru is getting known as one of the most extreme destinations for mountain biking around the globe. We have been showing great trails that we have on our Andes Mountains. Long lasting descents with more than 4,000m (13,123ft.) are not easy to find like in Peru!